SUNDAY – Activities end at 3pm. * A more detailed schedule will be provided upon your arrival to the retreat or you can request the schedule in advance. This retreat is now full. If you are interested in other related retreats, you can email us at info@famfi.ca. The aim of the retreat is to assist women with integrating family life, professional work, leisure time and social dealings more fully with their relationship to God. Each day will begin with morning Mass and include a series of meditations, talks, and spiritual reading, Holy Rosary and other Catholic piety practices. The specific agenda for the weekend will be provided on arrival. The agenda allows for time of private prayer and reflection. There will be opportunities for confession and spiritual direction. Recommended attire is business casual. 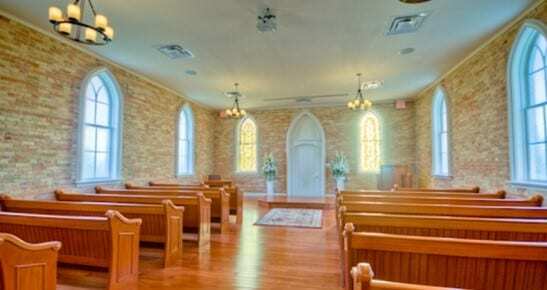 The Rose Chapel is a beautifully restored, century-old church with cathedral seating. For the duration of the retreat, the Blessed Sacrament is held in repose in the Chapel providing for silent personal prayer and devotion. A private common room in the Conference Centre and the Rose Chapel are reserved for the exclusive use of retreat participants. Hotel Lobby with fireplace and comfortable seating are also available for the use of the retreat participants. Your own personal, single occupancy room allows you to be truly recollected for a true retreat experience to renew your body and soul. The retreat will be conducted by Opus Dei, a personal Prelature of the Catholic Church. For more information on Opus Dei visit opusdei.ca. $100 non-refundable deposit to register. $275 to be paid at time of retreat. Includes: 2 night-stay at Best Western Plus Stoneridge Inn ~ single occupancy only. email info@famfi.ca if you have questions.